Homeland is a popular homozygous polled member of the STgenetics roster and one of the best all-around sires in the breed for consistently providing multi-trait improvement with a body type breeders favor. He compliments most breeding objectives with his dark red, short marked color and red eyes. His Proficient dam is a model cow in the KCF program and his grandmother is a preeminent flush sister to Encore's dam. 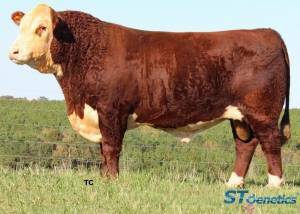 Homeland was the top selling bull at Knoll Crest in 2016 and has seen heavy use in their program and by several other prominent breeders.